Serving Greater Cincinnati, Ohio and Northern Kentucky. Loomis Interior has 23 yrs. 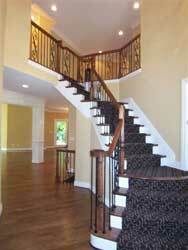 of experience serving high-end custom builders in Greater Cincinnati. Our clients return to us because we provide quality work in an expeditious manner to meet their demanding schedules. We offer our services in everything from consulting (when asked) to the installation of the complete interior finish trim package from the basics of doors and trim to kitchen installation, stair rails and custom made cabinets. We specialize in the high end custom homes but can be competitive in the mid-range homes as well. We can build your cabinetry on site which is the way some builders prefer or we can build them in our shop and deliver them to the job to be installed. We can deliver them as unfinished cabinets to be finished by your painter or we can deliver them prefinished with a furnisher grade sprayed lacquer finish or with a tough catalytic finish. As for design, we will go with your design or we can get with you or the homeowner and brainstorm the project and I will draw some options that you or the home owner can choose from. Contact us today! We look forward to working with you. Loomis Interior Carpentry, Inc., (859) 743-9796, fax (859) 918-5290, info@loomisinteriorcarpentry.com | Base Content Copyright © 2019 Market Hardware, Inc.